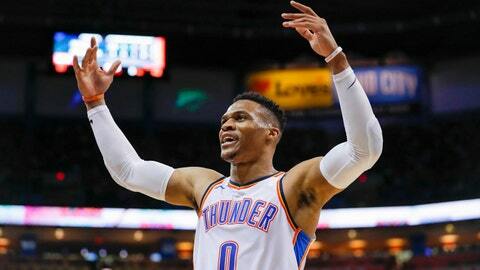 FOX Sports Oklahoma will televise Oklahoma City Thunder games during the first round of the 2019 NBA Playoffs, along with Thunder LIVE before and after each telecast on the network. Additionally, Thunder LIVE postgame shows will air after every Oklahoma City playoff game throughout the postseason. The opening game of Oklahoma City’s best-of-seven series with Portland will be televised nationally on ABC on Sunday, April 14. FOX Sports Oklahoma will provide complete postgame analysis on Thunder LIVE immediately following the completion of Game 1. FOX Sports Oklahoma will televise all remaining games of the series, beginning with Game 2 on Tuesday, April 16. The network’s broadcast team that covered the Thunder throughout the regular season will continue their work in the playoffs. Chris Fisher (play-by-play), former NBA power forward Michael Cage (analyst), Lesley McCaslin and Nick Gallo (reporters) will be on the call for Thunder games televised on FOX Sports Oklahoma. Handling pregame, intermission and postgame duties on Thunder LIVE will be John Rhadigan, former NBA point guard Antonio Daniels and McCaslin. Thunder playoff games televised on FOX Sports Oklahoma will stream on the FOX Sports digital platforms. Available to iOS and Android devices, the platforms provide live streaming video of FOX Sports content along with highlights and instant alerts for scores and key plays. Fans can download the mobile app for free from the Apple App Store and Google Play. Streaming on the FOX Sports digital platforms is also available on connected devices, including AppleTV, Android TV, FireTV, Roku and Xbox One. Game 2 Tuesday, April 16 Trail Blazers 9:00 p.m. 9:30 p.m. 12:00 a.m.
Game 3 Friday, April 19 Thunder 8:00 p.m. 8:30 p.m. 11:00 p.m.
Game 4 Sunday, April 21 Thunder 8:00 p.m. 8:30 p.m. 11:00 p.m.